The gatehouse was built in about 1455 for Thomas, Lord Scales. The original building was conceived as a courtyard house similar to Oxborough Hall, but there is no evidence that it was ever completed. The gatehouse, which was restored in 1864, is a rectangular three-storey building with polygonal turrets, an embattled parapet and shallow machiolations. On the ground floor there is a four-centred arched gateway flanked by windows. The first floor has a central oriel window with a 15th century base, and the coat of arms of Anthony Woodville, who was the son-in-law of Lord Scales. By the 18th century the house was derelict, and little of the 15th century house remained, apart from the gatehouse. 18th and early 19th century illustrations show the gatehouse as partly ruinous, and the house was bought by Sir Lewis Whincop Jarvis in 1856, who restored the gatehouse and added the south range in 1864. The south range is also built of brick, and has an oriel window on the ground floor, Gothick windows with stone surrounds and hood moulds, and an embattled parapet. In the corner of the moat is a four-storey square tower with a large oriel window. The interior dates entirely from the late 19th and early 20th century. The bridge across the moat dates to the 1860s and 1870s, and has an embattled parapet with octagonal piers surmounted by a stone pineapple. Magnificent 15th century brick gatehouse in rectangular moat. Other buildings 19th to 20th centuries. For full details, photos and aerial photograph references see file. E. Rose (NAU), 22 June 1981. Moat in excellent condition, surrounded by lawns to west and south, trees and some annual weeds to east and north. Banks are regularly mown and/or strimmed, and moat kept free of weed. H. Pateson (A&E), 13 May 1993. Earthwork Survey of NHER 3395 includes the moat of NHER 3393. Pottery: 3 joining Glazed Grimston sherds - base with knife-cut polygonal outline. 1 Glazed Grimston, in spoil just east of moat. Identified by A. Rogerson (NLA). See report (S3) for plan and further details. Site included in (S12) and survey also noted in (S13). Moat remains weed free, water filled. Earthworks in pasture field shows slight mole activity, no erosion by stock. H. Paterson (A&E) 23 February 1998. Manorial site scheduled 1999 (except standing buildings). Document in file for NHER 3395. An extant water-filled moat at Middleton Towers is visible on aerial photographs (S4-S11). The moat is slightly trapezoidal in form with a 10m wide ditch and internal dimensions of 75m by 41m. It surrounds the 15th century gatehouse and later house known as Middleton Towers. Only the moat and buildings are included in this HER record. All the other surrounding earthworks are included as part of NHER 3395. The moat, along with part of NHER 3395, is protected as a scheduled ancient monument. --- Unpublished Document: Norfolk County Council. Inventory of Historic Parks and Gardens of Special Historic Interest in Norfolk..
--- Archive: Ordnance Survey Staff. 1933-1979?. Ordnance Survey Record Cards. TF 61 NE 12 . --- Newspaper Article: 1960. Eastern Daily Press. 3 September. --- Archive: Clarke, R. R. and NCM Staff. 1933-1973. Norwich Castle Museum Record Card - Medieval. Middleton. <S2> Monograph: Steer, F.W.. 1961. 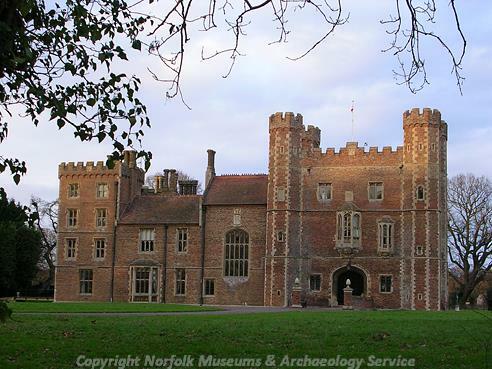 Middleton Tower, Norfolk: A Guide and Short History..
<S3> Unpublished Report: Cushion, B. 1995. Middleton Towers SMR3393 & 3395(part). Earthwork Survey Report. <S4> Oblique Aerial Photograph: Edwards, D.A. (NLA). 1974. NHER TF 6617A (NLA 13/ADB23) 12-JUL-1974. <S5> Oblique Aerial Photograph: Edwards, D.A. (NLA). 1974. NHER TF 6617B-C (NLA 13/ADE16-7) 12-JUL-1974. <S6> Oblique Aerial Photograph: Edwards, D.A. (NLA). 1978. NHER TF 6617J-K (NLA 69/AMF17-8) 21-SEP-1978. <S7> Oblique Aerial Photograph: Edwards, D.A. (NLA). 1987. NHER TF 6617AA-AD (NLA 194/DFD5-8) 22-SEP-1987. <S8> Oblique Aerial Photograph: Edwards, D.A. (NLA). 1989. NHER TF 6617AK-AN (NLA 226/DKB7-10) 26-JUN-1989. <S9> Oblique Aerial Photograph: Edwards, D.A. (NLA). 1986. NHER TF 6617AP-AR (NLA 178/DBF17-9) 15-JUL-1986. <S10> Oblique Aerial Photograph: Edwards, D.A. (NLA). 1992. NHER TF 6617AS-AV (NLA 316/FYP1-4) 23-JUL-1992. <S11> Oblique Aerial Photograph: Edwards, D.A. (NLA). 1996. NHER TF 6617AY-ABB (NLA 376/HZH4-7) 25-JUL-1996. <S12> Monograph: Cushion, B. and Davison, A. 2003. Earthworks of Norfolk. East Anglian Archaeology. No 104. p 117. <S13> Article in Serial: Gurney, D. (ed.). 1996. Excavations and Surveys in Norfolk 1995. Norfolk Archaeology. Vol XLII Pt III pp 397-412. p 403.